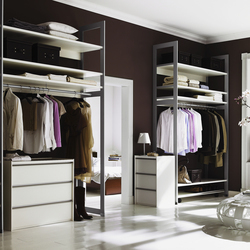 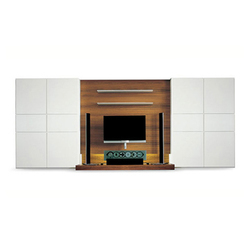 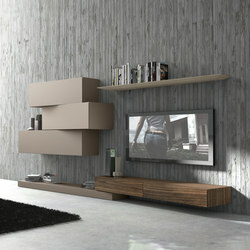 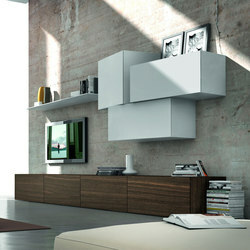 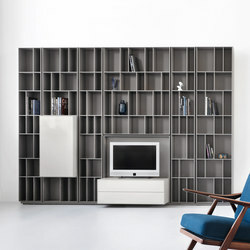 Wall storage systems form a fairly diverse product group. 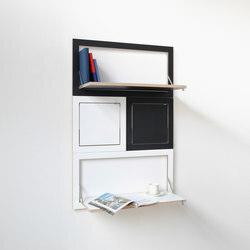 After all, their only common trait is that they are placed alongside, or mounted on, a wall. 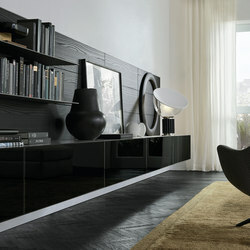 A wide variety of aesthetic, functional and material approaches means that any particular needs can be catered to. 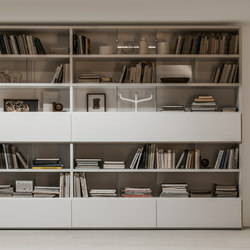 Consider the minimally detailed ‘Flex’, designed for manufacturer Piure by For Use, a modular, open shelving system whose compartments form a slightly irregular rhythm, which can also include large closed sections, or even larger compartments for side boards or a television set. 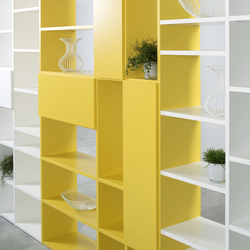 Some modular wall storage systems can be used to cover entire walls and wrap around the room, providing storage space for extensive personal libraries. 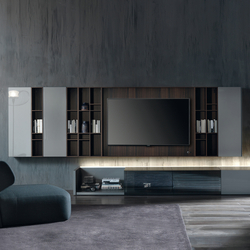 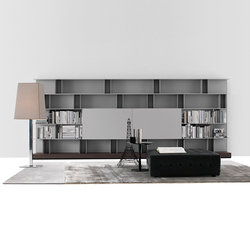 An example of such systems are the sober ‘Metropolis’ by Tisettanta and ‘Amineo’ by Gruber + Schlager, both of which offer combinations of different modules, open and closed storage space and a wide choice in different colours and materials. 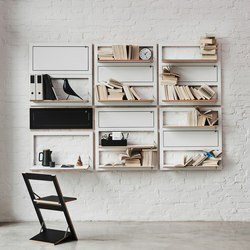 A more industrial aesthetic is explored in the ‘USM Modular Furniture Haller’, manufactured by USM and designed by Fritz Haller and Paul Schärer jr. 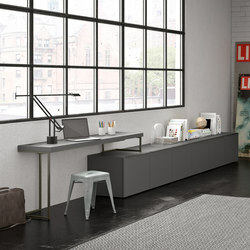 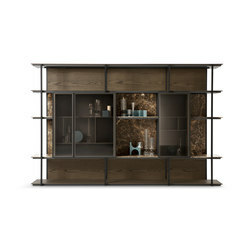 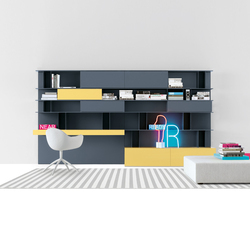 This ensemble features colourful fronts and shelves with exposed steel skeleton, and can be used to assemble whole wall storage system, but also a modest sideboard or an even smaller display cabinet. 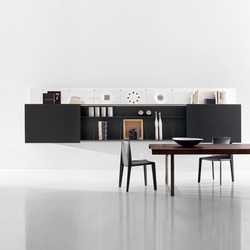 Another common approach is a more or less free composition of elements such as a sideboard, shelves, and wall mounted cupboards. 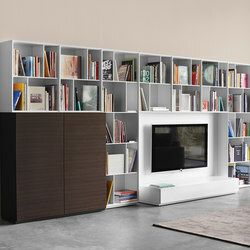 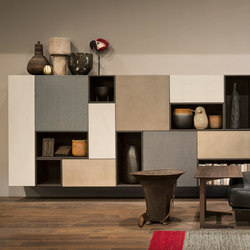 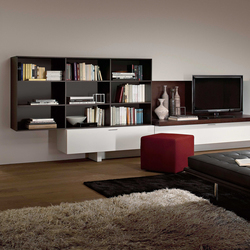 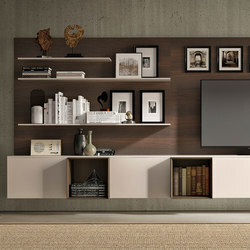 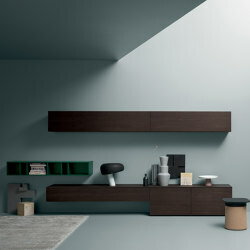 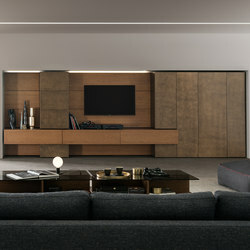 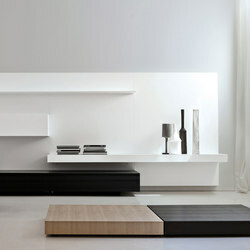 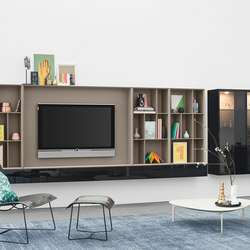 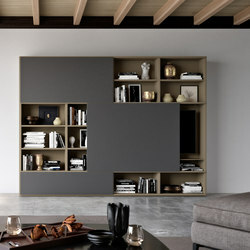 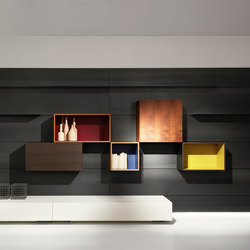 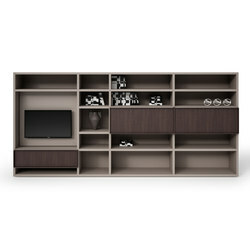 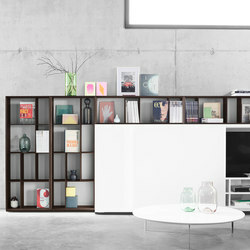 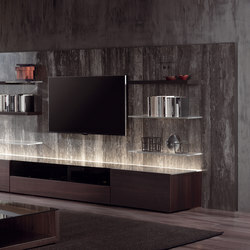 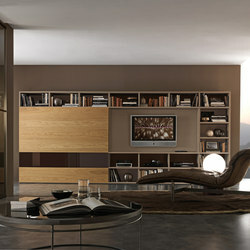 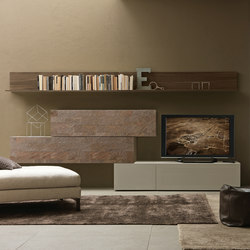 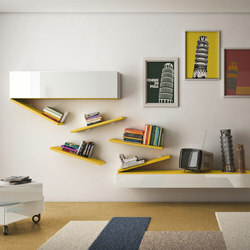 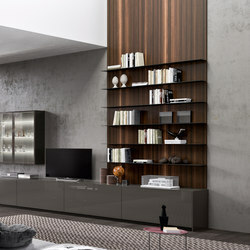 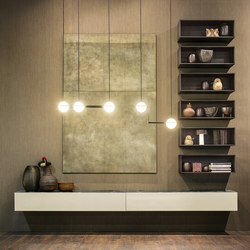 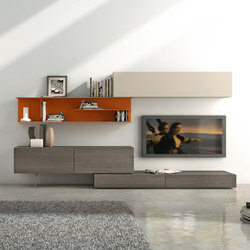 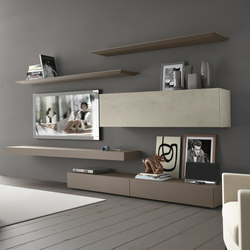 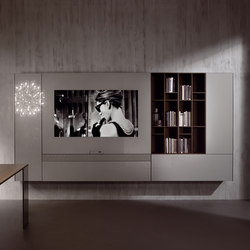 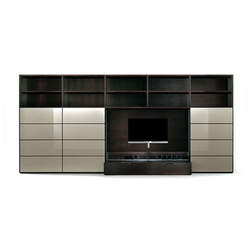 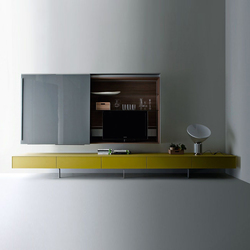 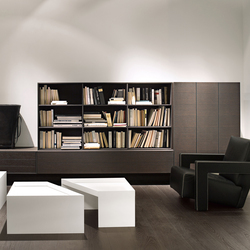 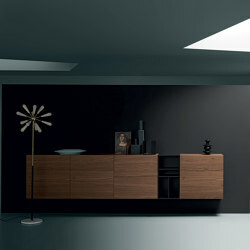 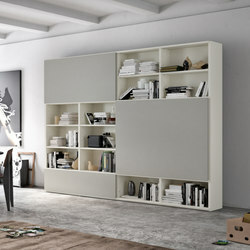 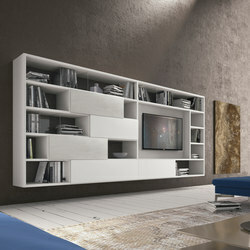 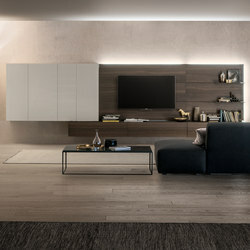 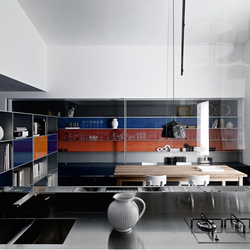 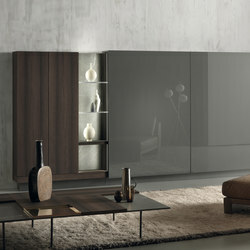 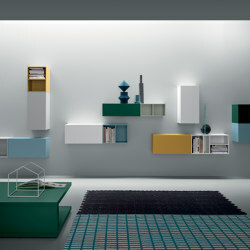 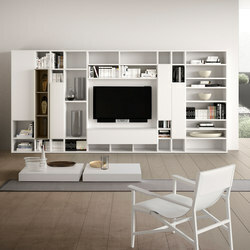 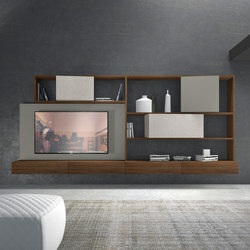 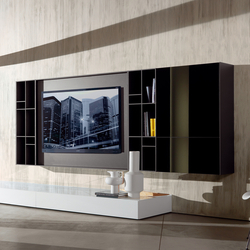 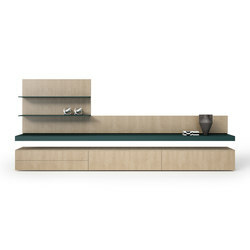 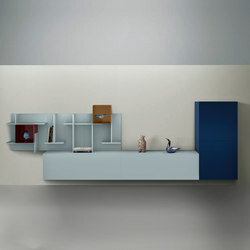 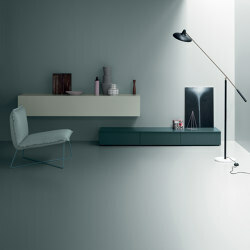 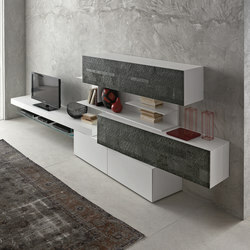 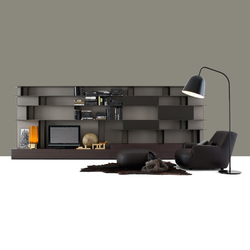 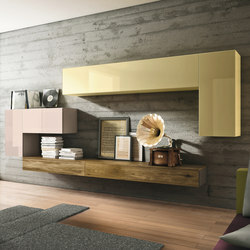 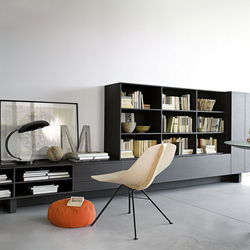 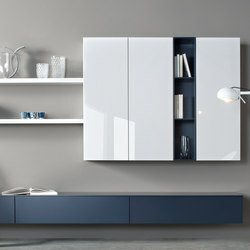 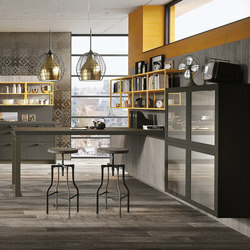 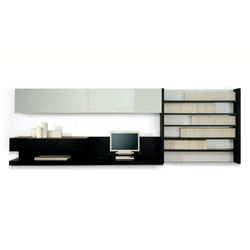 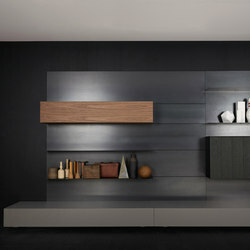 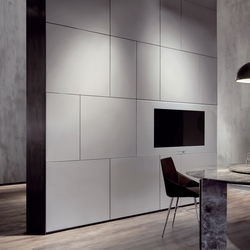 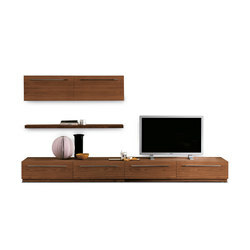 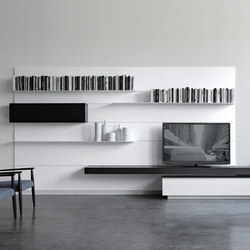 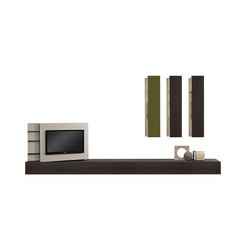 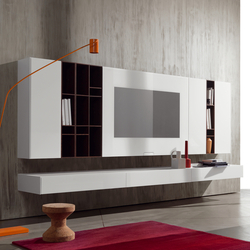 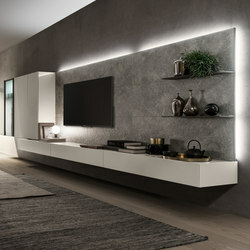 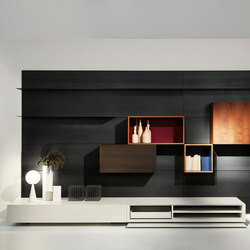 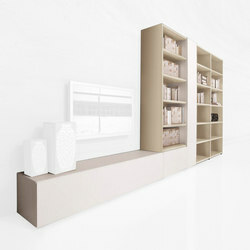 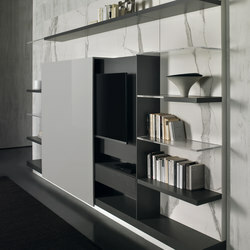 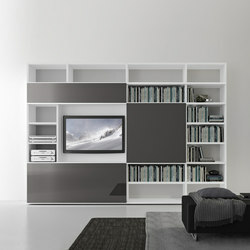 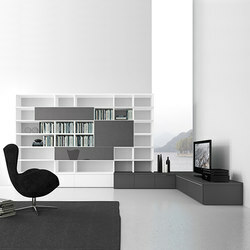 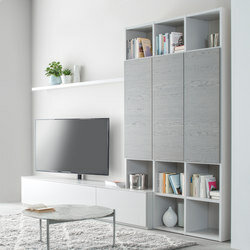 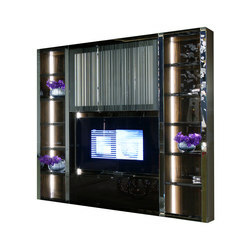 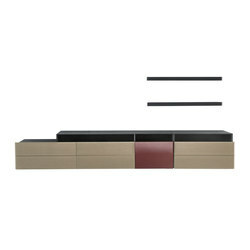 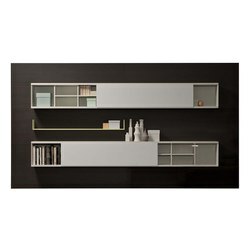 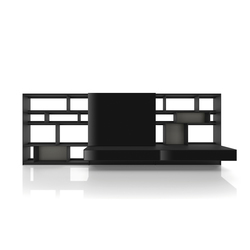 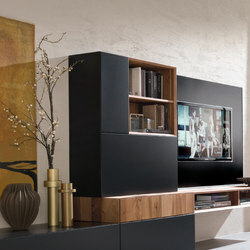 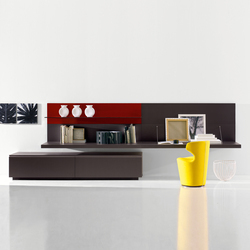 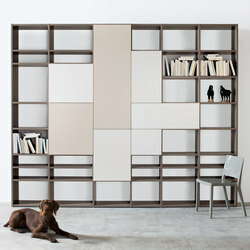 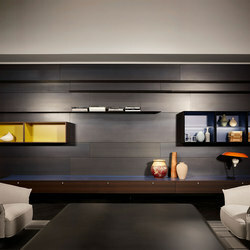 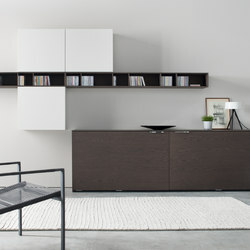 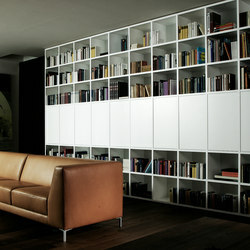 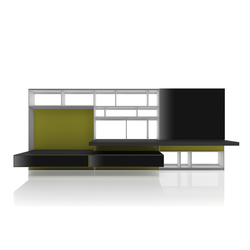 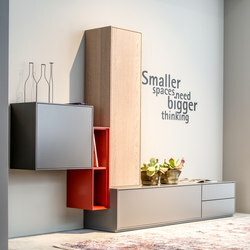 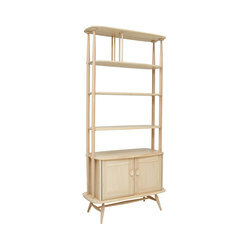 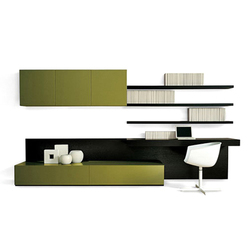 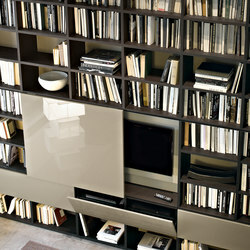 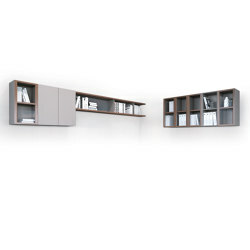 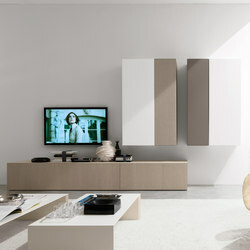 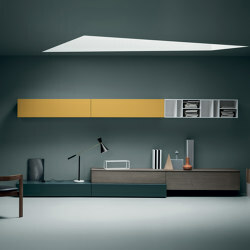 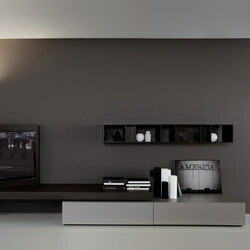 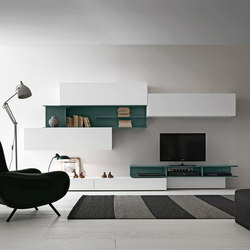 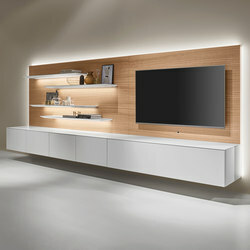 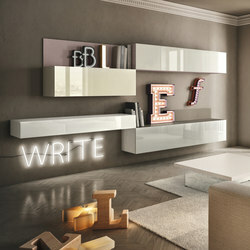 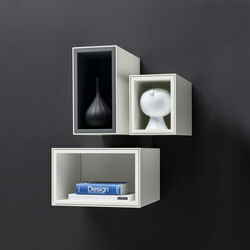 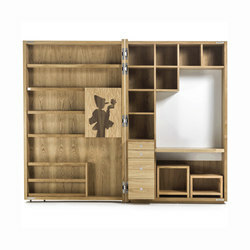 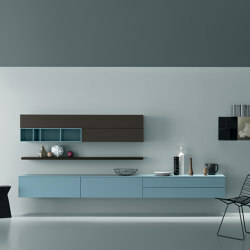 The ‘Quaro’ range, manufactured by Flötotto and designed by Peter Christian Hertel and Sebastian Klarhoefer, and ‘Cubo’, manufactured by Sudbrock, feature high and low sideboards, wall-mounted cupboards and open and closed shelves of varying depths, all of which can be composed according to the resident's wishes. 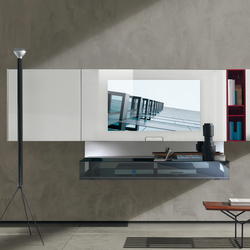 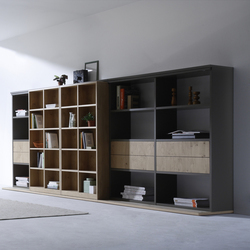 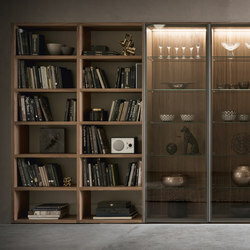 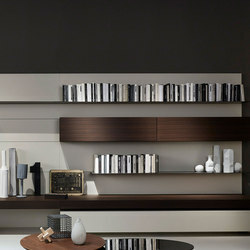 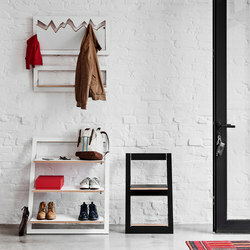 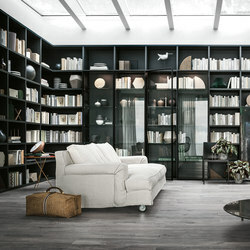 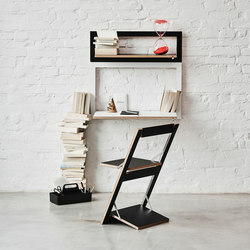 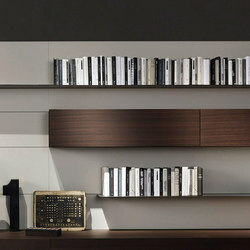 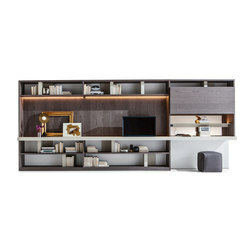 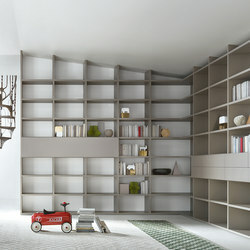 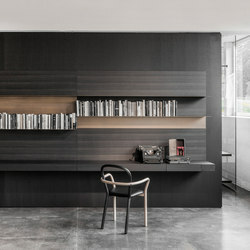 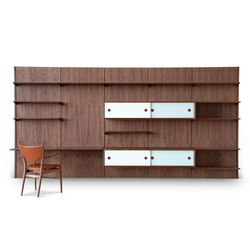 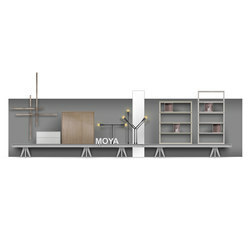 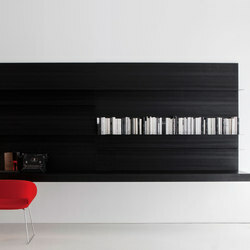 And finally, ‘Piano Design Bookshelf’, a combination of robust wooden shelves and slender steel supports, designed for Riva 1920 by the architect Renzo Piano, as well as ULTOM ITALIA’s ‘seixme’, can be placed against a wall, but they can also act as room divider, a ‘wall’ in their own right.